Thar be slides, slides, slides, way too many slides, from a presentation I did online yesterday as part of the ETMOOC Section on Digital Storytelling. You can find resources mentioned at http://cogdog.wikispaces.com/What+Mean+Ye+Storytelling and an archive is available. It was a lot crammed in. I wanted to play out the idea that as a concept, digital storytelling is something I don’t focus on defining, as most definitions fail to capture the range of things we see— in fact, they way I frame ds106 for my students is that I can’t tell them what storytelling is. The whole class experience is making that a question we pursue. And more and more and more and more, I find that shifting teaching from a “I know this and will transmit it to you” is way less interesting that taking a topic or concept and pursuing it together. Gee I feel so rhizomy. This is the image to represent my other liekly not so novel thought- we tend to get focused on the thing as something that contains a story- the video, the web page, the sound, the GIF, the book, the movie– I do not see the media form as the story. The story is our relation to it, what we impart to that media, the way we share an experience with others. It is between us. Media are not stories to me. A picture does not tell a story. It might launch one, or instigate one, or represent a story. But the story is between that picture of the rock and you. 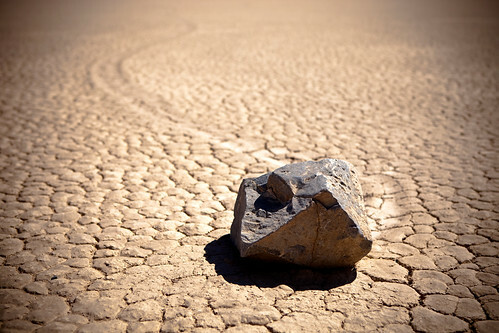 It might by the story of how those sailing rocks move across Death Valley (explanatory story). It might be the story of that travel from the rock’s perspective or a tweet the rock might say (imagined personified story). It might be how kids play pranks and move the rocks or how they are moved by aliens from the Thorgazian Nebula (wildly fictional narrative). it might be a poem about exquisite or grand travels (metaphorical story). It might be an animated GIF of the rock sliding across the desert floor (a story of motion). I have no idea if that really makes sense or matters to people. It does to me. If you are looking for the story, or creating one, don’t just feel like the media created is or even needs to be the whole story. In a fully developed complex story, e.g. a produced film, you find as many untold stories (behind the scenes making of, alternative endings, the wide open range of fan fiction), and a universe of remixes. Anyhow, I tried to spit out a variety of examples that indicate the range of story possibilities of what web based stories could be. Samplers, not fenceposts. One key method IMHO is not constraining your ideas to just the explicit features a tool might offer. I’ve been thumoing the drum for 5+ years, yet one of the most underutilized features of flickr every teacher can find a use for is the ability to annotate an image with hyperlinked popup notes. You can go even farther by putting hypertext links on the notes. This opens up a world of multi-pathed stories or choose your own adventure ones – I used my 50 Ways example from Dominoe’s story. Another variation, and again, it happens to be flickr cause If I was Stranded on a Desert Island With Only One Web 2.0 Tool It Would be Flickr. In 2011 I tried an experiment with taking 10 Dailyshoot (predecessor to the Daily Create) prompts and each day writing a section of a story in reverse. Huh? Have you seen Memento? On January 31, 2011, my first photo was the prompt for the end of the story and each day, the photo I took and the narrative I wrote were done in reverse, until February 19, 2011 I wrote what would be the opening of the story. Right now you should be terribly confused. Just shrug it off. My lesson is meant to be that you can do a lot to re-interpret these digital tools and platforms in ways their designers never imagined. You are not limited to what the tool can do. You are only limited by what you imagine is possible. 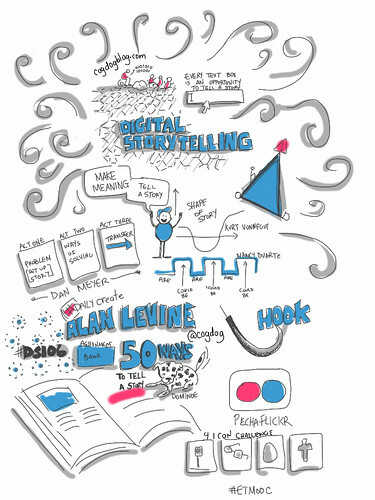 I did a speed run through of 50+ Web 2.0 Ways to Tell a Story. I skipped through Five Card FLickr Stories since we had people in etmooc do that last week on their own. And woah did they- I see 34 created stories out of a pool of 130 photos they went out and tagged. Next, I tried something I’ve not done before in Collaborate, I did a screen share and we did a live run through of pechaflickr, my improv mashup of pecha kucha + PowerPoint Karaoke * random(flickr). We had volunteers from the audience take turns saying lines over the slides (Alan’s not to self, a 30 second interval would have been better with slide lag). I’ve done this successfully in Google Hangouts and recently presented on pechaflickr using pechaflickr. I then tried to give an overview of ds106 in about 10 minutes, probably generating information whiplash and a few speed of presentation infractions. This session was a bit of an experiment for some future sessions, and I plan to parcel this back out to be separate topics. Thanks to everyone who stepped in front of the firehose, and apologize for those whom spilled Java all over their computers and got locked out. You can catch the show via free on-demand. It presents a whole new way to think about the arc of a story.